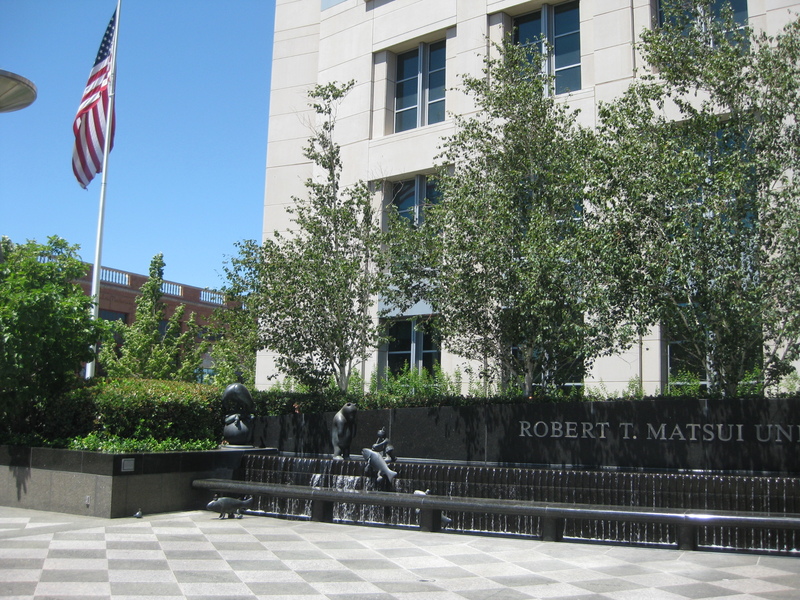 A stand of beautiful white-barked trees forms a soft backdrop for the Gold Rush fountain in front of the Sacramento Federal Courthouse at 501 I Street. 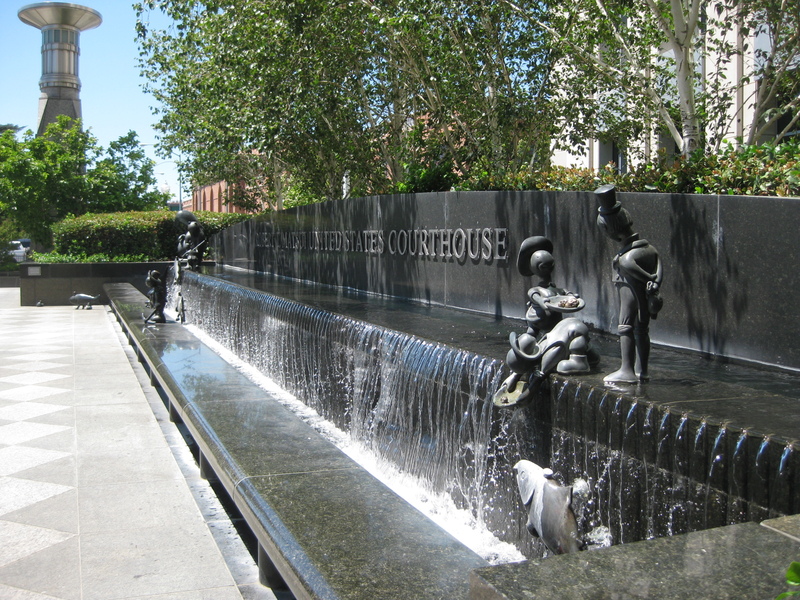 This fountain is more than just a cascade of water; cartoonish bronze figures dot the entire plaza. 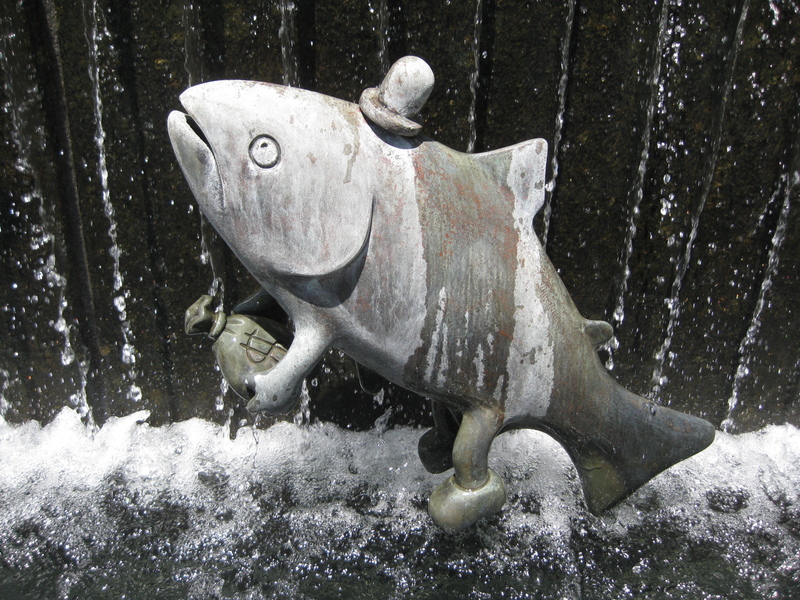 Anthropomorphized animals, Native Americans, Western miners, pioneers, and even Uncle Sam, are in and around the symbolic river creating an allegorical image of the Gold Rush. 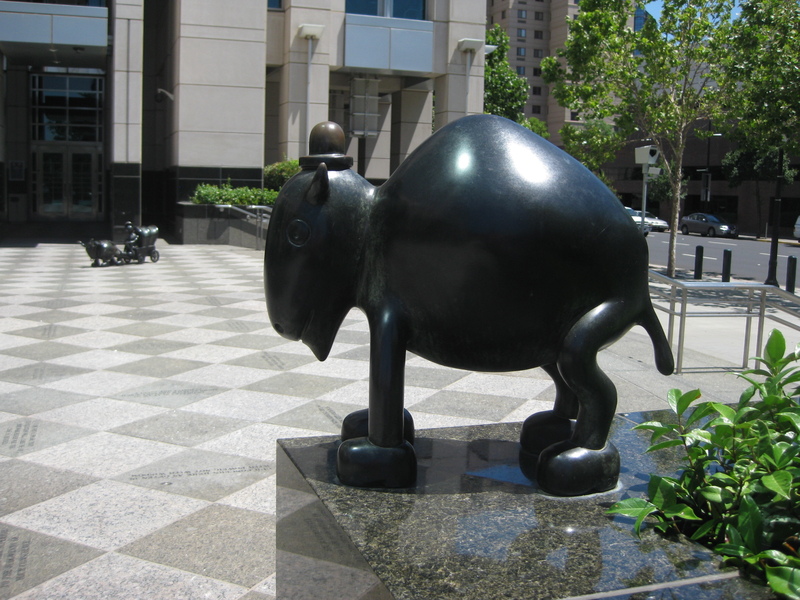 Otterness’ public art work appears across the US, Canada, and worldwide (5). One of his best known works is, Life Underground, that includes more than 100 different pieces scattered throughout subway stations in NYC. 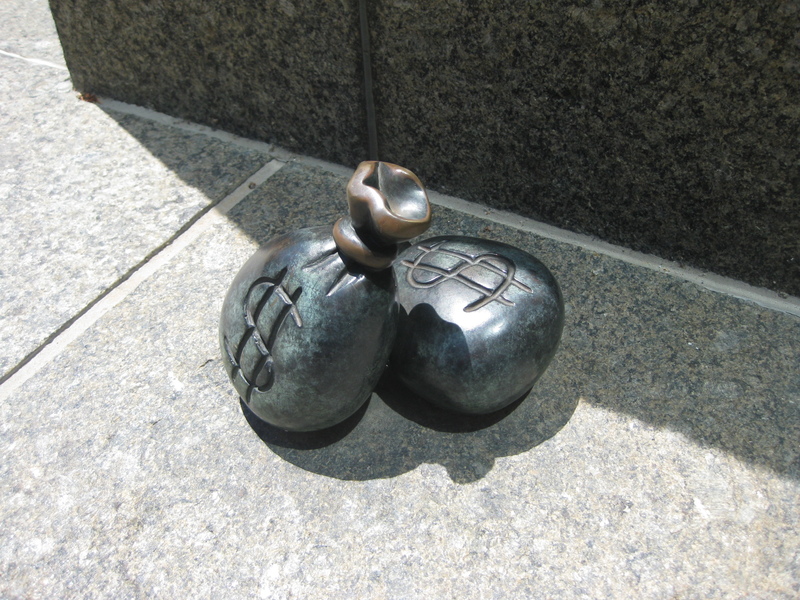 Otterness described the subject of Life Underground as “the impossibility of understanding life in New York” (6). 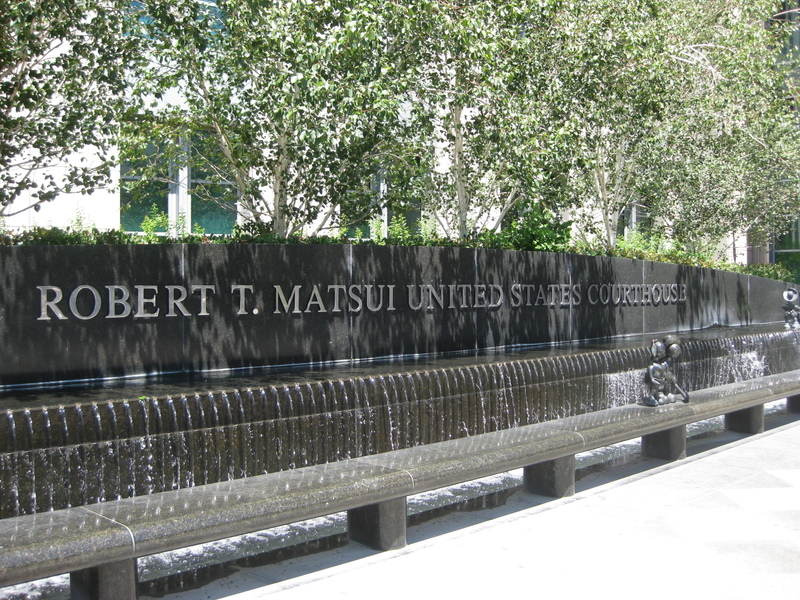 Controversy surrounds Otterness an awful act of animal cruelty that he did as art in 1977 (8). He issued an apology but it is a disturbing fact of his history. 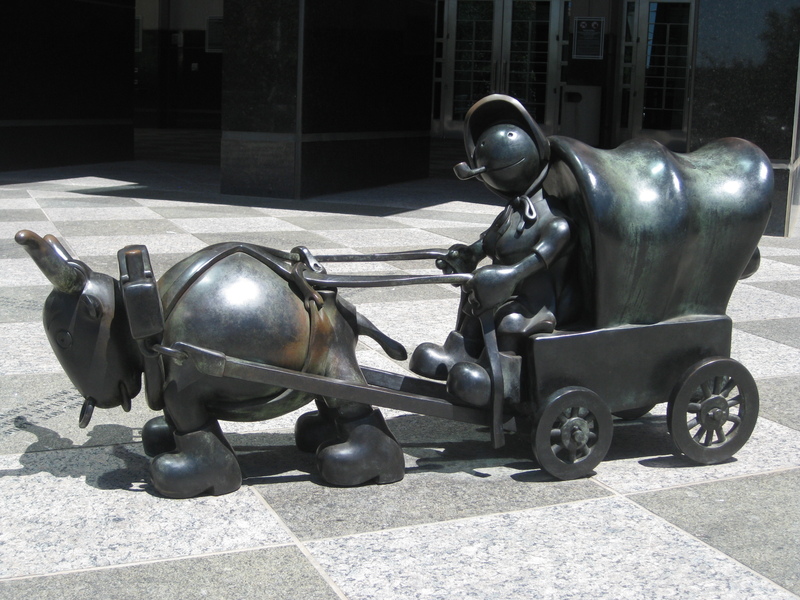 A native of Wichita, Kansas, sculptor Tom Otterness is known for creating bronze and cast stone scupltures. 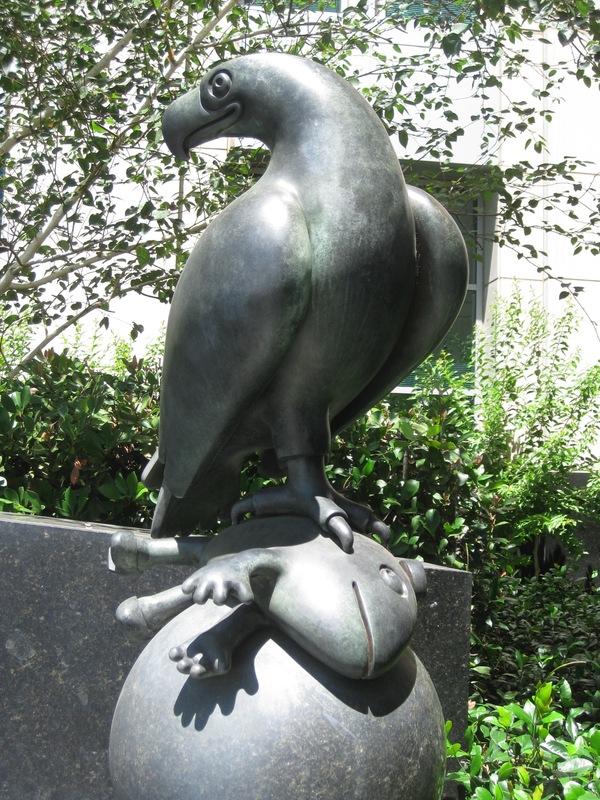 Most of his work utilizes allegorical human and anthropomorphic animal figures. 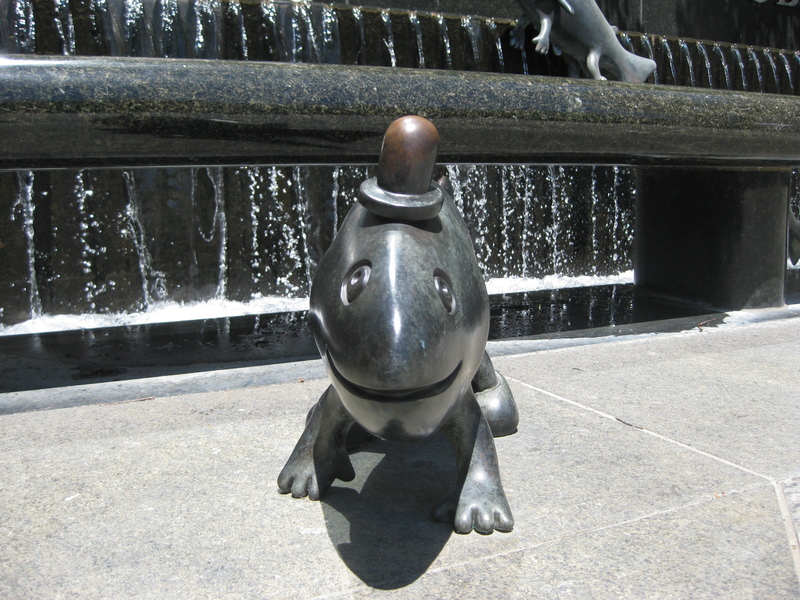 Otterness includes humorous elements in much of his work, even when dealing with serious social or political subjects. 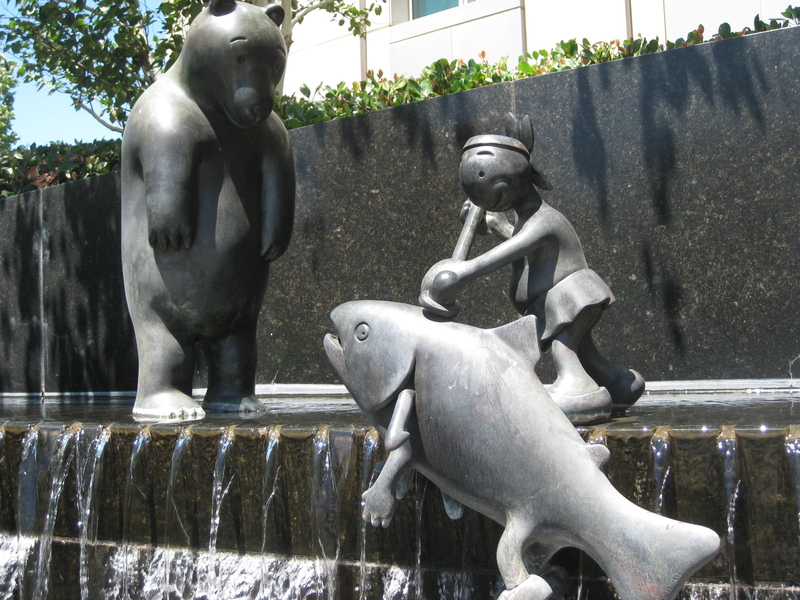 For the Sacramento Courthouse, artist Otterness created an assortment of knee-high characters reminiscent of California’s early history – animals and fish, native Americans and pioneers. 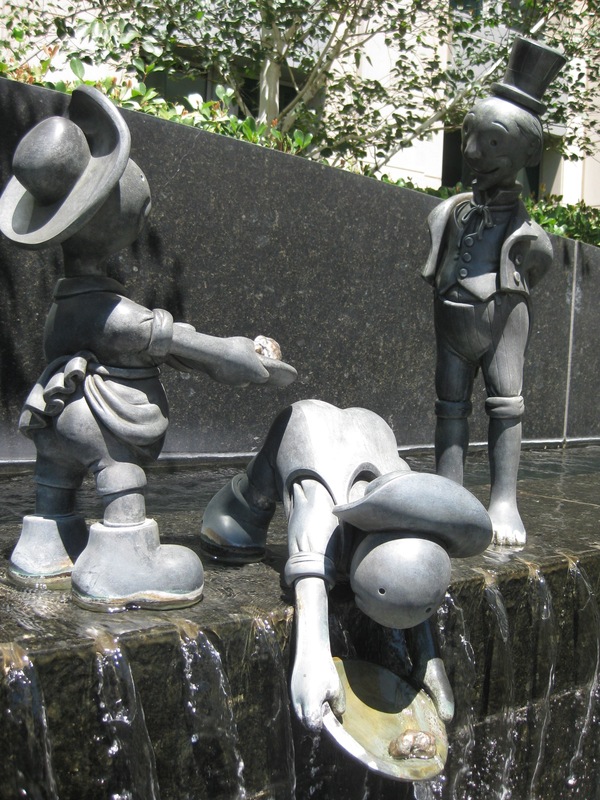 He choose to position his whimsical yet enigmatic figures along the plaza’s fountain, which serves as a reminder of the significant role the Sacramento River and other waterways have played in the history of the state. 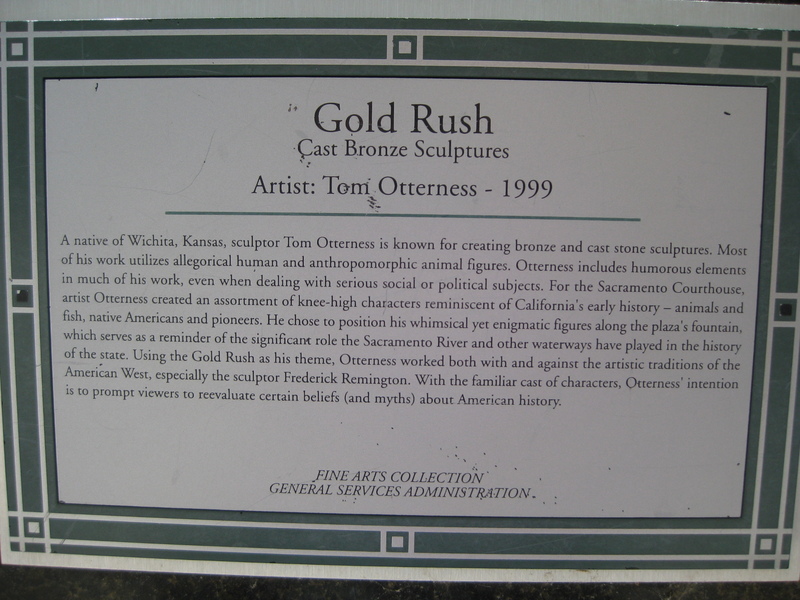 Using the Gold Rush as his theme, Otterness worked both with and against the artistic traditions of the American West, especially the sculptor Frederick Remington. 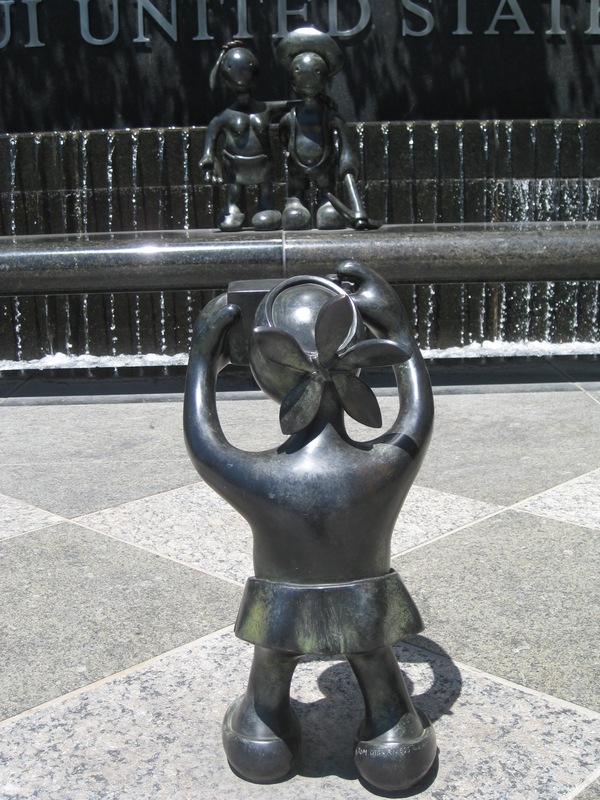 With the familiar cast of characters, Otterness’ intention is to prompt viewers to reevaluate certain beliefs (and myths) about American history.